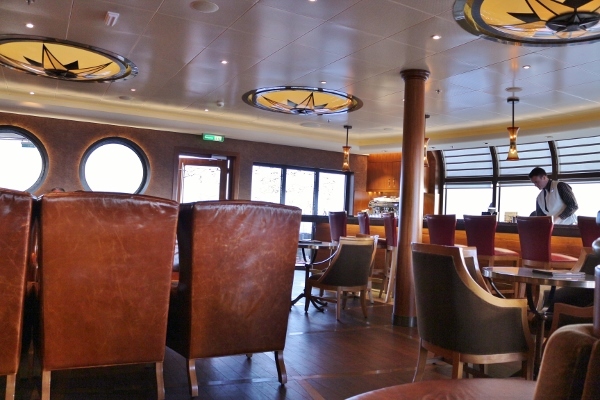 In both of Disney Cruise Line's Dream Class ships, the Disney Dream and its sister, the Disney Fantasy, which we were aboard, exist two fantastic adult only dining experiences housed on either side of a travel-themed bar aptly called Meridian. Palo, which means "pole" in Italian is inspired by Venice and named after the poles that Venetian gondoliers use to steer. 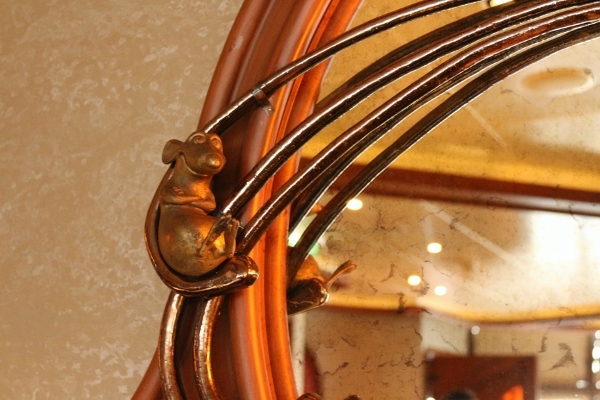 Remy, on the other hand, is an upscale French establishment with charming references to the Disney Pixar film Ratatouille. I have previously discussed brunch at Palo on more than one occasion, and intend to share my recent dinner experience in an upcoming blog post, but today the focus is entirely on Remy. 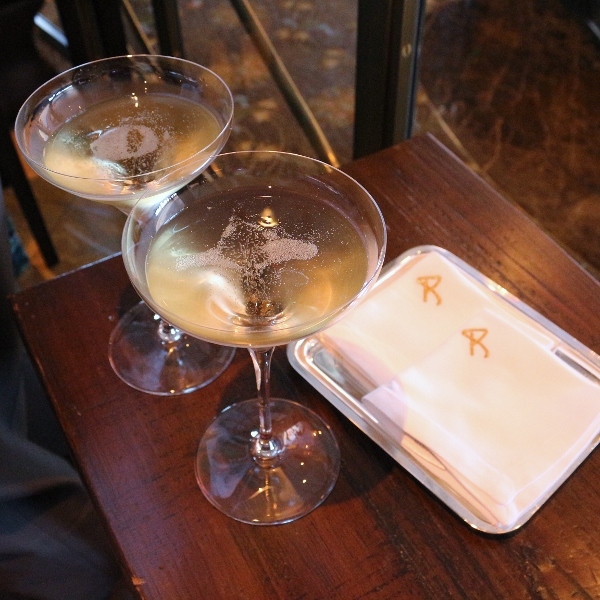 I actually penned a guest review regarding dinner at Remy for The Disney Food Blog, but on my most recent venture I explored the Champagne Brunch option instead. 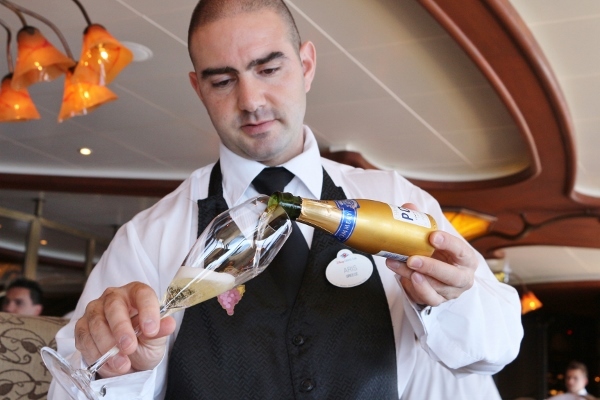 At present time, Disney Cruise Line charges $55 for the Champagne Brunch (with an optional Champagne pairing for an additional $30) and $85 for dinner. For each brunch seating, about a dozen or so diners first gather in the wine room where the chef and sommelier gather to introduce the meal and Champagne pairings. 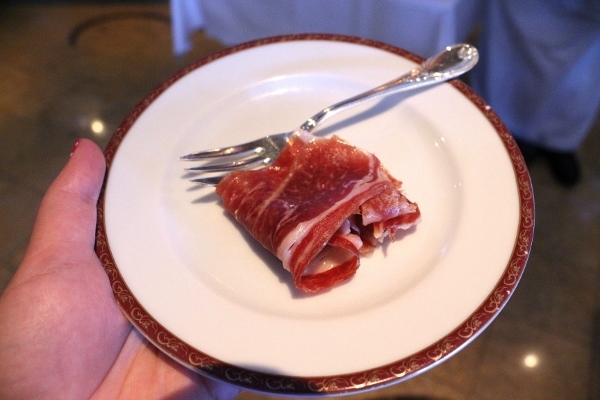 Small plates of Pata Negra are passed around. Pata Negra is a specific type of Jamón Ibérico, or Iberian ham, deriving from free-range black pigs that consume mainly acorns during the latter part of their lives. 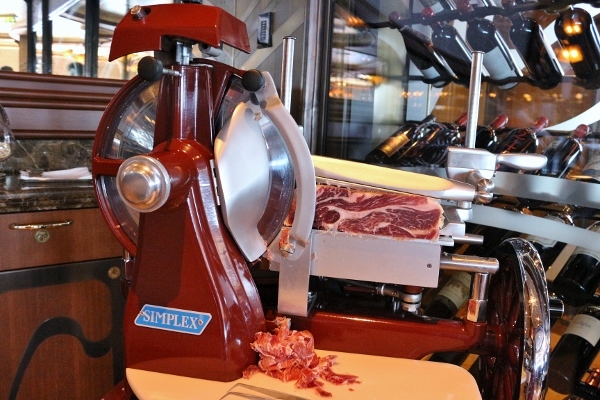 The ham is sliced paper thin using a hand-cranked machine. Anything more mechanical would overheat the fat and ruin the ham's delicate nature. 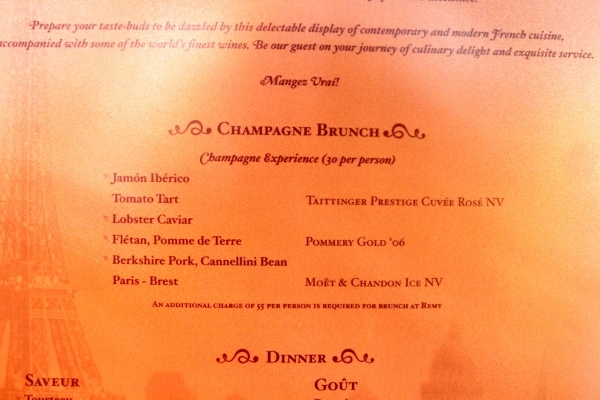 Glasses of Taittinger Brut Champagne are included with the meal and are served now with the Pata Negra. The Pata Negra is absolutely sublime in both texture/mouthfeel and flavor, and the crisp Champagne helps cut through some of the richness of the fat. 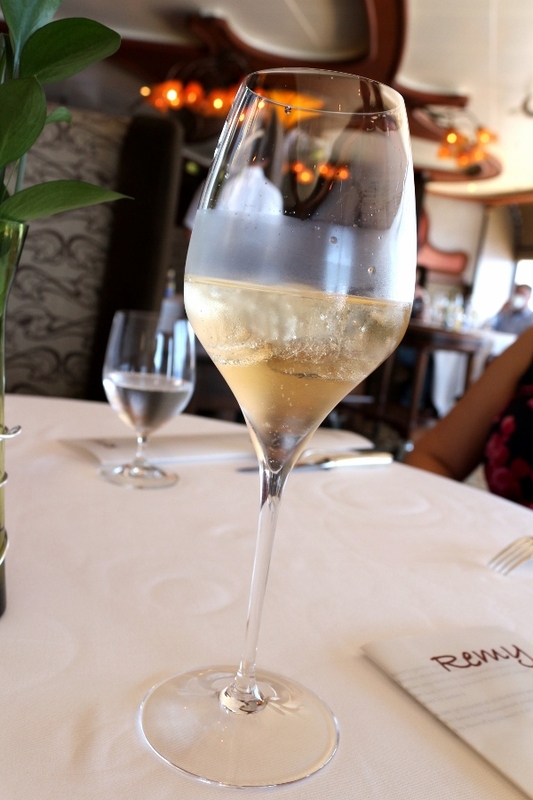 Together, this is a luxurious way to begin our midday meal at Remy. Guests are then escorted to their tables to begin the next phase of the meal. Let's take a moment to discuss the ambiance at Remy. The decor is a combination of elegance and whimsy. 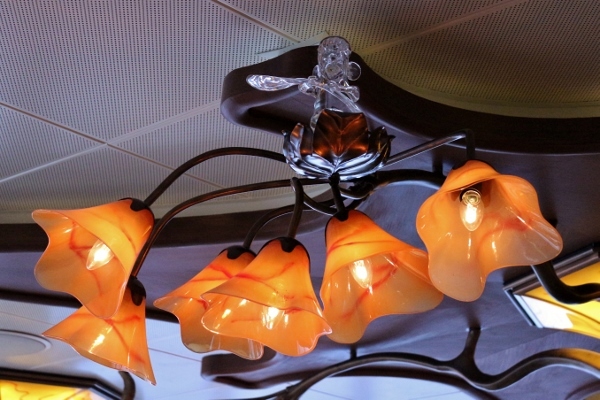 A Sworovski crystal replica of the restaurant's namesake Remy is perched above the dining room, peering down from a chandelier. Remy's likeness is carved into the wooden backs of chairs, stitched into the plush fabric of the booth seating areas, and molded into metal to frame mirrors throughout the dining room. 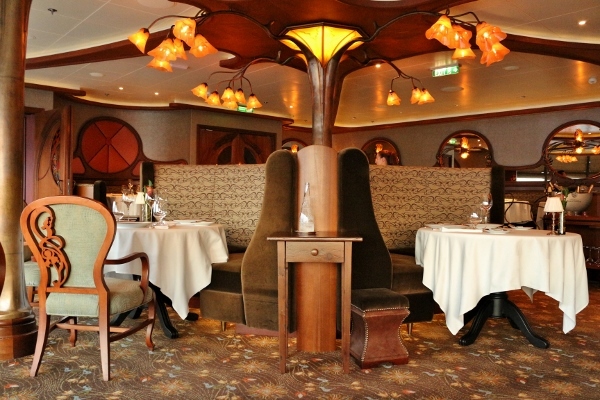 The incredible Gusteau Room sits just beyond the main dining room. Both areas feature floor-to-ceiling windows, while the Gusteau Room has an extra bit of warmth from the incredible painting depicting the kitchen at Gusteau's, as well as golden-toned paintings of the Parisian skyline. The handmade rug is another focal point in this intimate setting. While dinner at Remy offers diners a couple choices between selections for each course, the Champagne Brunch includes a set menu across the board (unless, of course, you are vegetarian or have certain dietary restrictions which would elicit different dishes). 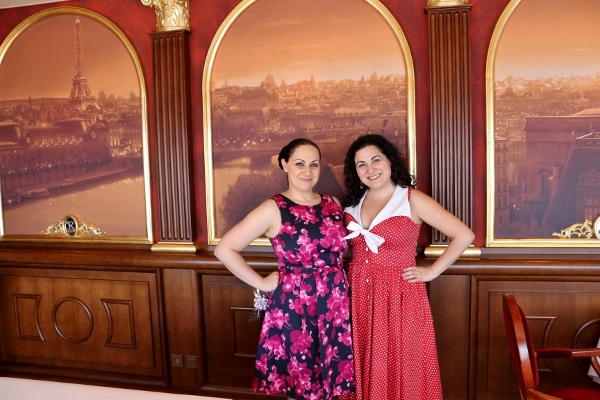 This set menu can change over time, but I will share what is currently being offered at Remy on the Disney Fantasy. 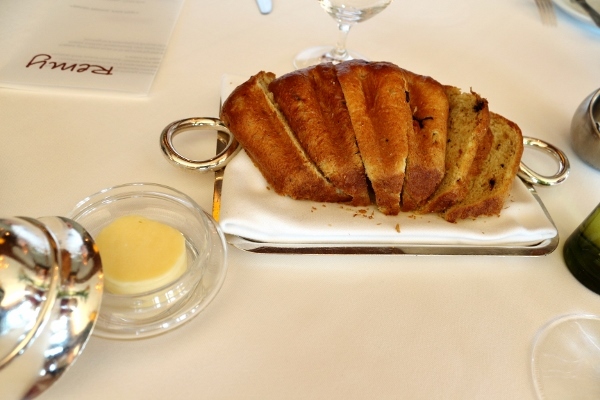 We begin with the bread course, which features a truffled brioche. 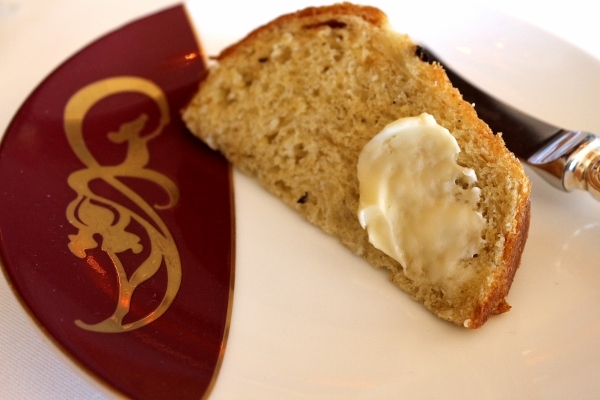 The delicate flavor of truffle permeates this rich bread. 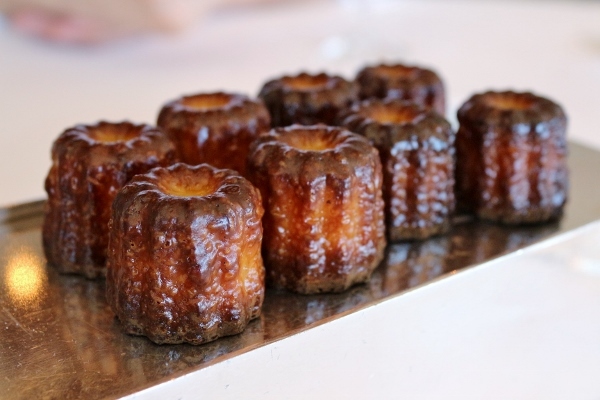 Slicked with a dab of softened butter, this is a decadent beginning in true French style. 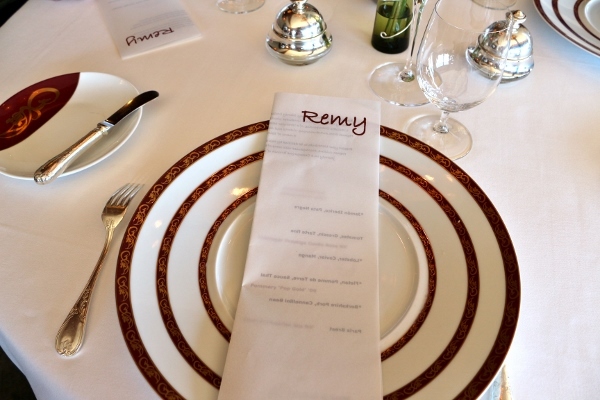 Note the detailing on the plate--Remy is everywhere! We decided to add on one pairing to our meal to be shared between the three of us at the table (myself, my sister, and her husband--yup, I'm the ultimate third wheel). The first official Champagne pairing is intended to be enjoyed with the first two courses: Taittinger Prestige Cuvée Rosé NV. It had a crisp, fruity flavor and is made from a blend of grapes, including some of the skins during processing, yielding the gorgeous blush color. 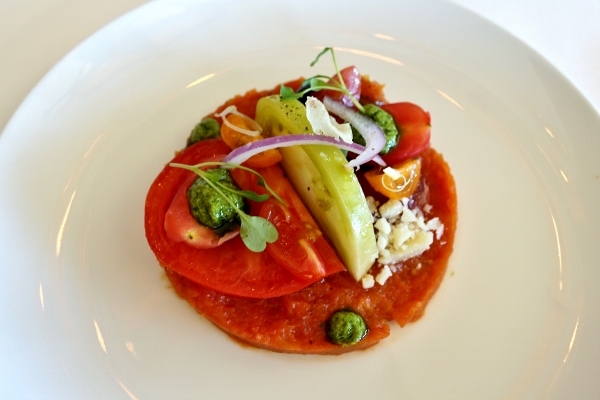 Our stunning first course is a tomato tart unlike any other. The tart shell itself is found within the thick tomato puree comprising this tart. The dough is placed between sheet pans and baked to retain a thin and crunchy texture. 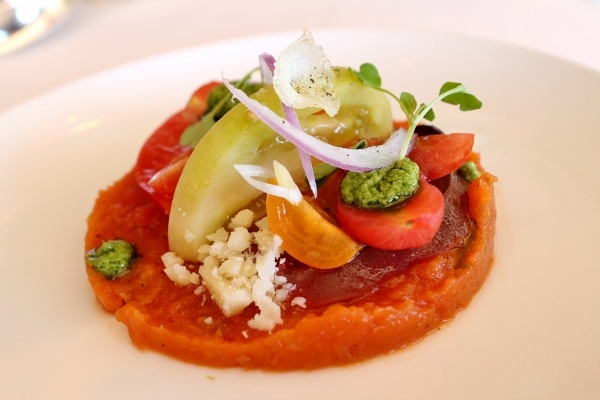 It's then encompassed with intense tomato flavors, both in a thick puree, and in bites of fresh heirloom tomato on top. Basil pesto and sharp crumbly cheese--I believe it's Parmigiano--finish the dish. 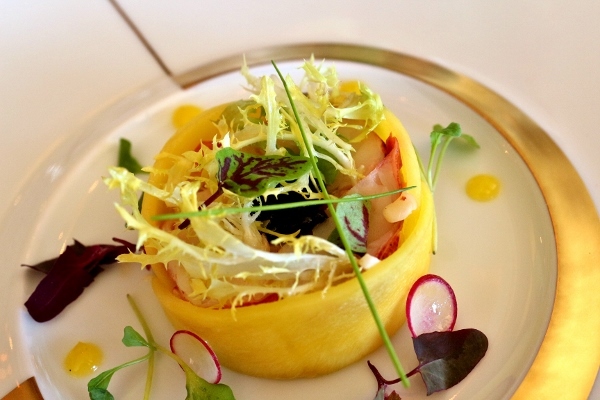 This dish is the epitome of summer, and definitely one of my favorite courses of the meal. A lobster caviar course follows, featuring ribbons of mango, lobster salad, vanilla aioli, mango Champagne vinaigrette, and finally a small spoonful of caviar. 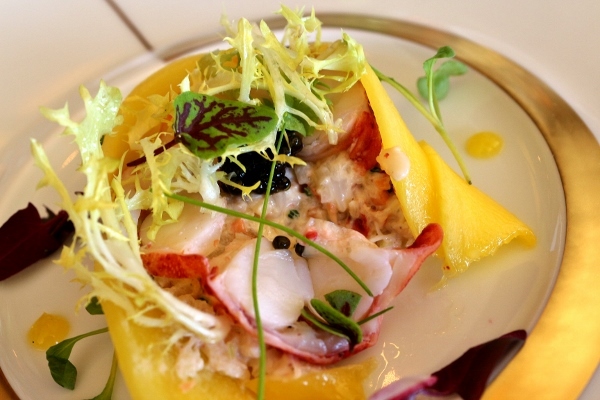 The sweetness and tartness of the mango is a wonderful foil to the surprisingly light lobster salad within. The brininess of the caviar highlights the flavors of the sea in this colorful second course. The second Champagne pairing is now served: a playful miniature bottle displaying the word POP in prominent letters. 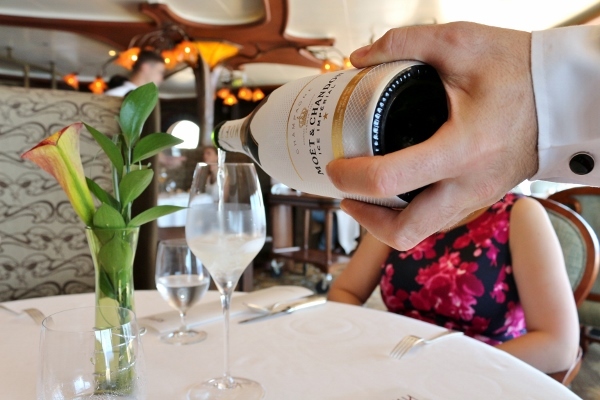 Pommery Gold '06 is a dry and crisp Champagne which compliments the next two courses beautifully. The fish course is next. Seared halibut is served over a potato espuma (ie foam-like puree) and a Thai sweet and sour sauce made with ginger, grapefruit, homemade ketchup and citrus. My initial thought was, "sweet and sour sauce at Remy?" but alas, this dish is sophisticated beyond first impressions. 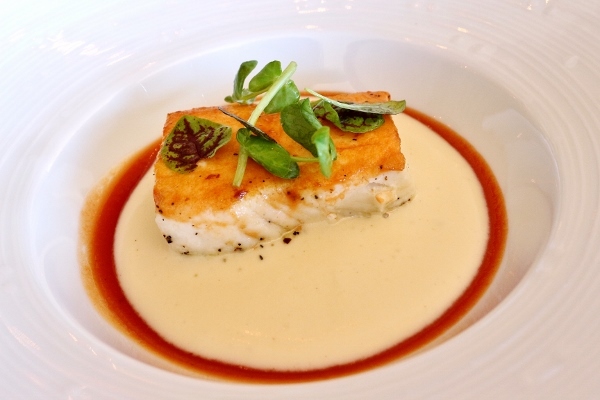 The halibut is cooked to perfection, resting in velvety potato foam. The sweet and sour sauce is actually the most assertive flavor in the dish (as expected) but it plays off the fish and potato perfectly, and is actually quite restrained for such bold flavors. 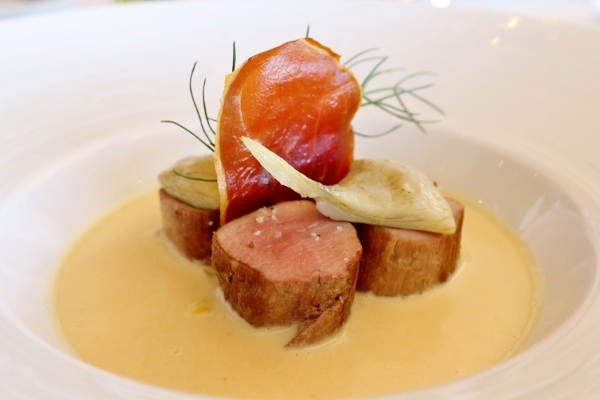 Next up is a lovely Berkshire pork tenderloin, cooked medium, served over a leek ragu and cannellini bean sauce, and finished with fennel fronds, artichokes, and a crisp bite of cured ham. The smooth cannellini sauce is a delicious revelation. The pork is exceptional both in quality and cookery. This is a not-too-heavy main course for a truly special midday meal. Our final Champagne is incredibly unique. The bottle itself is designed by Louis Vuitton! 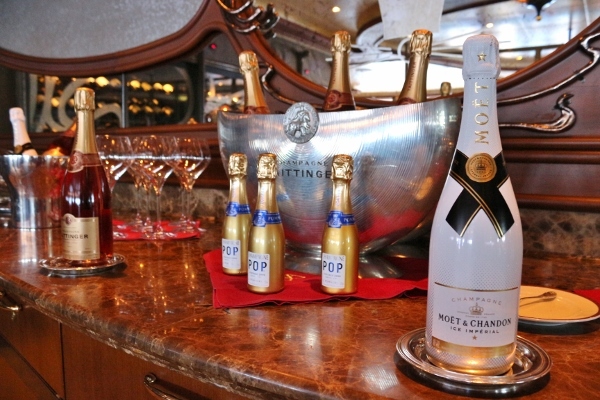 Moet & Chandon Ice NV is actually designed to be (and tastes best when) served over ice. Allowing the ice to slightly water down the Champagne while keeping it ultra chilled the entire time opens up the fruity notes of this elegant bubbly. 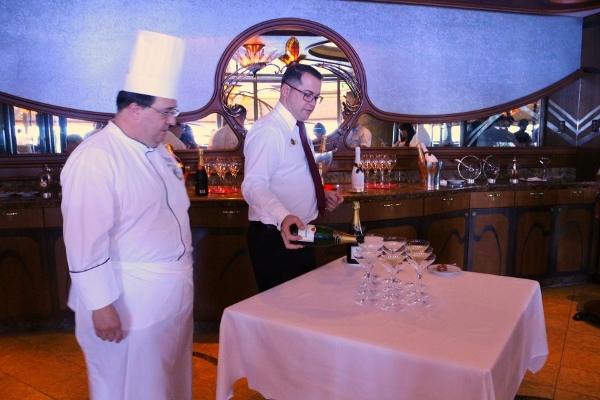 Remy actually sells bottles of this Champagne to guests (for about $69, I believe), signed by the chef and delivered to your stateroom on the final evening of the cruise! 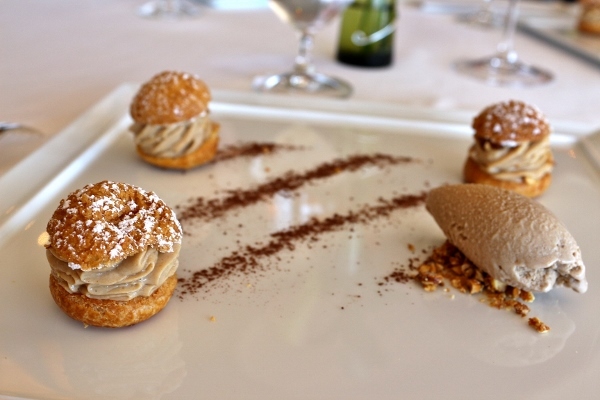 It's served with dessert, Paris Brest, which is choux dough (the pastry for cream puffs, eclairs, and profiteroles) filled with hazelnut cream and served with praline ice cream. This may actually be our overall favorite course. In theory it's so simple, yet the hazelnut flavors totally hit the mark, and were not overly sweet. 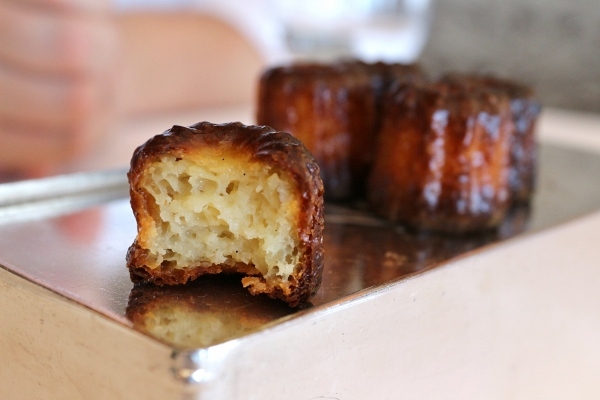 A final flourish comes with a small plate of cannelles, a small custardy French pastry enriched with rum. I'd like to take a moment to give a shout-out to our incredible server Giuseppe. 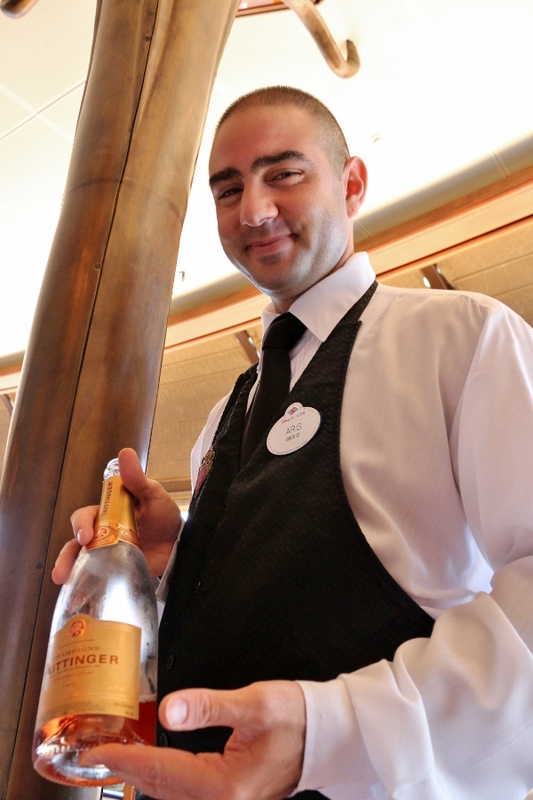 He was actually our server a year ago for dinner at Remy, and he did an incredible job during our brunch as well. For that matter, the entire staff is professional, courteous, and as knowledgeable as they come. Once again, Remy absolutely fills my heart (and stomach) with pure joy. I know that a meal here can be considerably pricey, but the additional charge is definitely worth it if you enjoy fine dining. 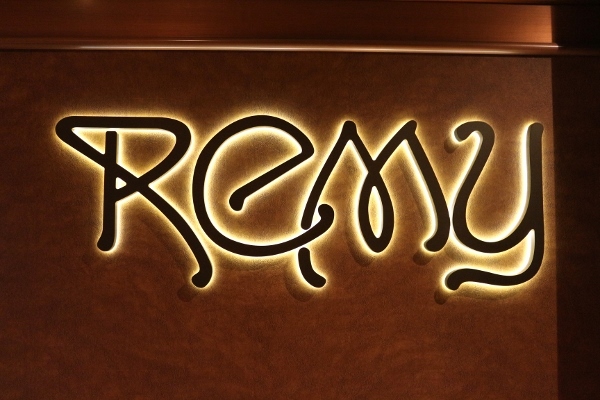 The food at Remy is exceptional, and the entire experience is not to be missed.